01.05.2015 We, the Youth of the Partido de los Trabajadores Socialistas (Socialist Workers’ Party) in Argentina, raise our voices with you, the youth in the streets of Baltimore, just we have with youth of Ferguson and many other cities across the U.S. We stand in solidarity with all the young people fighting against the brutality of the cops that is killing black people in US, and which is practiced against youth throughout the world. 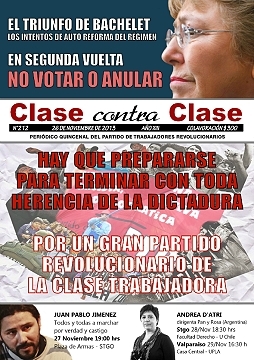 20.04.2015 The Left and Workers’ Front came in third place in Mendoza, the fifth electoral district of the country. On Sunday night after primaries elections, governor candidate Noelia Barbeito for the Left and Workers' Front announced they had got near 7 percent of the vote. 13.04.2015 This is a big step for the strategy of Obama's administration, that needs the cooperation of the Iranian regime to fight the Islamic State in Iraq and Syria and the Taliban in Afghanistan. 13.03.2015 The statement of the US President, Barack Obama, that Venezuela is a "threat to the safety of the United States," is a leap in the aggressive actions by imperialism against the Latin American country. 20.02.2015 The dispute over immigration reform and the obstructionism of the Republicans against the timid concessions offered by Obama produce the illusion of a dispute between antagonistic forces. A closer look reveals that, despite differing in tactics and in discourse in order to appeal to their respective electoral bases, the two parties defend similar interests. 10.02.2015 Greece is a supreme example of the accumulated effects of the world economic crisis. As the editorial writer of the Financial Times, Martin Wolf, indicates, unemployment has reached 26%, and the GDP is also 26% below its peak before the crisis of 2008. The expenditure of Greek society on goods and services has shrunk by at least an accumulated 40%. According to Paul Krugman, the "domestic devaluation" that took place in the Hellenic country, as a result of the fall in wages, and therefore, of the unit labor costs, reaches 16%. 30.12.2014 "It is a huge win for us that today, the workers who fought for their jobs for six months without pay will be reinstated.."
The end of "Obama mania"
25.11.2014 The November 4 midterm elections gave the Republicans an even more overwhelming victory than the opinion polls predicted. The Republican Party increased its power in the House of Representatives, got the majority in the Senate and kept several governorships. It even managed to re-elect the Governor of Wisconsin, Scott Walker, who imposed profoundly anti-worker and anti-union legislation. 31.10.2014 Jerusalem has turned into one of the key settings of the conflict between Israelis and Palestinians. The summary execution of a young Palestinian and the subsequent decision of Prime Minister Benjamin Netanyahu, to close access to the Esplanade of the Mosques, are only the most recent expressions from an extensive history of violence and oppression by the State of Israel. During the week that is coming to an end, Jerusalem was a setting of an escalation of tensions and confrontations. 21.09.2014 Thursday September 18th, 2014 | 5 pm - After the 3rd roadblock at the Panamericana Highway, the workers participated in a rally along with supporting organizations. 11.09.2014 At press time for this edition, US President Barack Obama presented his military strategy for dealing with the militias of the Islamic State (ISIL) in Iraq and Syria. 31.08.2014 After the meeting of striking workers that we held Saturday August at the entrance of 16th, at the entrance of Donnelley plant, along with the Internal Commission of LEAR, we came out strengthened. When we left the factory with our flags and drums, thousands greeted us by chanting, "Here they are, those are the workers without a boss! ", as we used to call out to the workers of Zanon (Zanon is a ceramic factory under workres’ control in Neuquen province) every time we went to support them. "Now you can hear it, now you can hear it, Lear, Donnelley, the same struggle"; "Unity of workers ". For years, we have been fighting for class unity to face these battles. Sunday was a sunny day, and we felt empowered by sharing the day with our families and the entire community of the neighborhoods close to the factory in a Solidarity Festival with bands and street musicians of the area. Seeing our children supporting us and in good spirits, it gives us strength. 24.08.2014 The murder of the young African-American Michael Brown, at the hands of the Ferguson city police, less than two weeks ago, has again ignited anger in the US against racial oppression, which has caused thousands to get mobilized throughout the country. The response to the anger unleashed by the death of this young man, who was unarmed, has been repression. As time passes, more information about his death and the increasingly brutal police violence is being made known. 20.08.2014 After 10 days of a truce during which no agreement for a ceasefire was reached, the State of Israel again bombed the Gaza Strip from Tuesday, August 19. Taking as an excuse the launching by Hamas of 3 missiles that fell on Israeli territory without causing victims or material damages, Prime Minister Benjamin Netanyahu's Zionist government ordered the resumption of the military offensive. More than 80 aerial attacks were carried out, with a toll of almost 30 Palestinians dead and dozens of wounded. The main target of the Zionist army was the chief of the military wing of Hamas, Mohamed Deif, who directs the al-Qassam Brigades. For this, the Zionist army launched five missiles on his home, killing his wife and eight-month old son. The fate of Deif, who was living in hiding, is still unknown. 20.08.2014 On Saturday, August 16 in the Garin neighborhood in the North of Greater Buenos Aires, the Conference of Workers in Struggle was held. 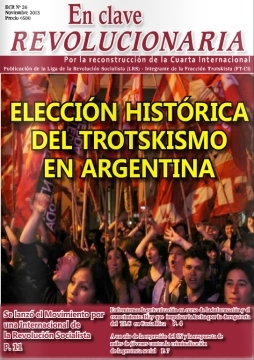 The event brought together the most combative sectors of the workers’ movement in Argentina. Along the Pan-American highway, across from the gates to the Donnelley printing plant, now under worker control, the shouts could be heard of “Families left in the streets, no more!” This conference takes place amidst increasing dismissals and layoffs, while at the same time, the government and the union bureaucracy have stepped up attacks against the Left and the most advanced workers. After a lineup of dozens of speakers, the workers voted on several important resolutions. Representatives from Lear, Donnelley, and EmFer led the conference, which despite being organized in only a few days, brought together 3,000 comrades. Among the speakers were representatives from many of the most important workers struggles today along with leaders of the Left and many historic workers’ movements. 20.08.2014 Saturday at dawn, we, the workers watch over the plant, guard the floors, walk around, control everybody’s movements, and send each other text messages. For weeks, we observe them steadily. We know the imperialist bosses maneuver constantly, setting barbed wire around the factory, placing bars on doors and windows, attempting to take away the raw material (what is prevented by the workers), and diverting the production to other workshops. These are all attempts to intimidate and divide us, thus creating a climate of terror. 15.08.2014 After 4 days of protests, dozens of arrests and two people wounded by the police (one of them in critical condition), anger continues on the streets of Ferguson, a small place in the state of Missouri. "No justice, no peace," "Hands up, don't shoot," "Where is Mike? Everywhere!" are some of the slogans of the mobilizations and protests unleashed by the murder of Mike Brown. On Saturday, August 9, in the city of Ferguson (Missouri, US), a cop murdered the African American teenager Mike Brown, 18 years old. The police stated at the beginning that Brown had attacked the police officer, but all the witnesses claim that the young man was unarmed, and they shot him when he had his hands in the air (an obvious sign to show that one is unarmed). Mike had recently finished high school and was getting ready to enter university the following Monday. 08.08.2014 Today a new (the fifth) National Day of Action took place for the reinstatement of all the workers laid off by Lear. During a peaceful car caravan along the “Panamericana” Highway, the Gendarmerie stopped a car, broke the windows, threw pepper spray inside and violently arrested the people inside. 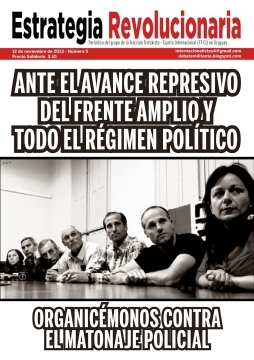 The detainees are: (1) Victoria Moyano Artigas, daughter of the disappeared*, (2) Guillo Pistonesi, member of the CeProDh (Center of Professionals for the Human Rights), Patricio Del Corro, Buenos Aires City elected Legislator for the Left Front, and (4) María Chaves, teacher at the Buenos Aires University (UBA), researcher and women´s rights activist. 01.08.2014 The following video shows a senior officer in the Argentine gendarmerie, Alberto Lopez Torales throwing himself against a car during a caravan protest. Lopez Toralez breaks the windshield and dents the car while other gendarmes kick the car. 25.07.2014 Since the transnational company Lear at the plant in Pacheco announced the lay off of more than 100 workers and several more furloughs the workers -together with the support of many organizations- have been waging a heroic battle for the total reinstatement of all the laid-off and furloughed. 18.07.2014 The conflict between Israelis and Palestinians seems to be doomed to be eternal. The conclusion is deduced from the experience of numerous failed attempts at negotiation, during the 66 years of existence of the State of Israel. 12.07.2014 After Gestamp, it is Lear’s turn, another subcontracted company in the automobile industry, to fight. The economic crisis is worsening in Argentina and the automobile industry is one of the hardest hit. Thus, the largest automobile manufacturers have imposed technical unemployment upon their workers. Subcontractors have not only adopted this same policy, but have gone above and beyond by essentially laying off the most combative workers and “class struggle” shop stewards. All of this has been put in place with the complicity of the SMATA union bureaucracy , close to Cristina Kirchner’s government and one of the most corrupt and historically violent union bureaucracies, which denounced dozens of activists to the military during the last dictatorship. 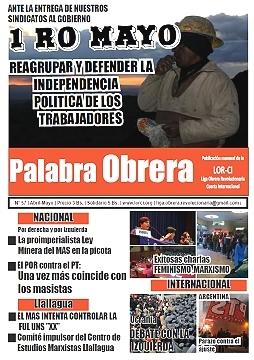 On Tuesday, July 8, several social and political organizations called for a day of solidarity with Lear workers. The Socialist Workers’ Party played a fundamental role in the organization of this mobilization, which was a great success. Despite this success and the sympathy among workers with regard to this conflict, Lear workers have not yet been able to break the reactionary front made up of the government, the union bureaucracy and the imperialist corporation. The heavy repression against protesters is the very proof of this. However, this repression has had a heavy political cost for the “left-wing” of the government, which describes itself as a government of “human rights”. Just as we are writing this, we can cite dozens of wounded and arrested protesters. 09.07.2014 Thomas Piketty's book Capital in the 21st Century has reached second place on the Amazon bestsellers list, and third on the The New York Times' list. According to The Guardian “Carrying it under your arm has, in certain latitudes of Manhattan, become the newest tool for making a social connection among young progressives.” The book that some consider the counterpart of the Fukuyama “moment” that took place more than a decade ago, and which is suggestively known just as “Capital” in the US, has generated an overwhelming variety of reviews from every position of economic theory. 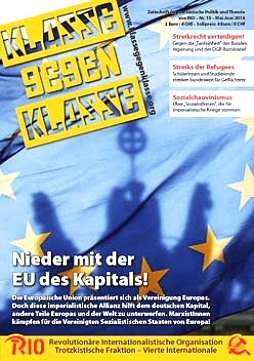 In the context of the ideological emptiness in bourgeois theory created by the Great Recession, it is by no means coincidence that Piketty's book, which focuses on the dynamics of inequality in the capitalist economy, has become a significant political event, especially in Anglo-Saxon countries, and particularly in the US. 08.07.2014 Great National day of action resisting Gendarmerie repression, with roadblocks in "Panamericana", "Puente Pueyrredón", Córdoba, Mendoza, Neuquén, Rosario and all over the country. Female activists have been beaten up. The demonstrators organize to free the five activists who where arrested. 08.07.2014 Workers of the auto-part plant Lear in Argentina undertake a roadblock at a central location in Buenos Aires (Corrientes with Callao) as a capstone of the day of action for the reinstatement of the laid-off and furloughed workers, and for the freedom of those arrested during the brutal crackdown led by the Gendarmerie earlier this morning, in a bloackade at the "Panamericana" road. Among those hurt by these repression there is Victoria Moayno, recovered granddaughter*, and the lawyer Charly Platkowski, president of the Buenos Aires branch of the "Center of Professionals for Human Rights" (CEPRODH). 07.07.2014 Rubén Matu , shop steward at Lear announced “This Tuesday, beginning at 5:00 a.m., we will launch a national day of struggle to demand the reinstatement of all laid off workers at Lear. We will also be fighting against the layoffs that are occuring throughout the country. This is happening in Lear, in Emfer, where the workers suffered police repression, and other factories such as Donelley and Valeo, where the employers are carrying out massive layoffs. 07.07.2014 We condemn the dismissals, layoffs and attacks on Lear delegates! At the end of May, the multinational Lear Corporation laid off 330 workers from its Pacheco plant in Buenos Aires Province for an indefinite period, without even initiating the bankruptcy proceedings as required by law. The workers refused to accept the situation and organized assemblies and road blockades. As a result, the Minister of Labor issued a ruling confirming that the suspensions were illegal. At the end of May, the multinational Lear Corporation laid off 330 workers from its Pacheco plant in Buenos Aires Province for an indefinite period, without even initiating the bankruptcy proceedings as required by law. The workers refused to accept the situation and organized assemblies and road blockades. As a result, the Minister of Labor issued a ruling confirming that the suspensions were illegal. 05.07.2014 From June 20-22, the PTS held its XIV Congress in Buenos Aires, Argentina. More than 300 delegates from across the country took part, among them workers from the steel, printing, food processing, service, and sugar industries, along with teachers, municipal workers, secondary students and university students.